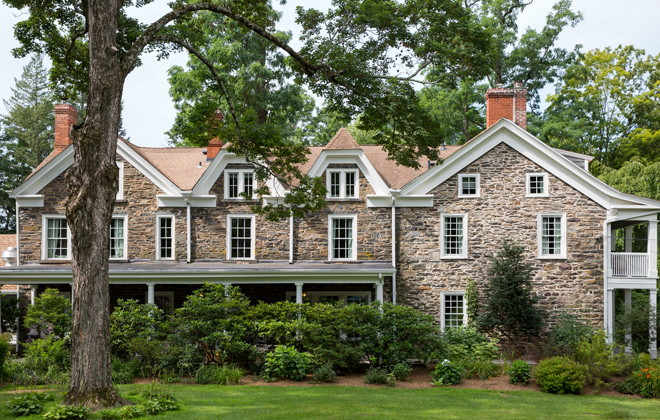 Formerly the Inn at Stone Ridge, this 18th century estate has recently been renovated and restored to be a beautiful, country chic getaway. Just two hours north of New York City, the Hasbrouck House sits on 55 acres of beautiful Hudson Valley grounds. Not to mention, a 100 acre orchard that is just a hop skip and a jump away! The Dutch style stone mansion, along with a number of other houses on the property, were originally built in 1757, and the new owners have taken many pains to keep all of the gorgeous old-world details intact. But, they’ve also taken the opportunity to update the house with some very elegant modern touches, meaning this is not from your average, stuffy old country Inn. In fact, the only thing that can even be described as stuffy is the pillows. Working with many amazing local designers, like Materia Designs, Upstate Stock, and Jay Teske Leather Co., every room in the house is just fabulous. Totally Interior Monologue. They even have a few rooms filled with Fornasetti Wallpaper (which my readers know I’m totally obsessed with!) 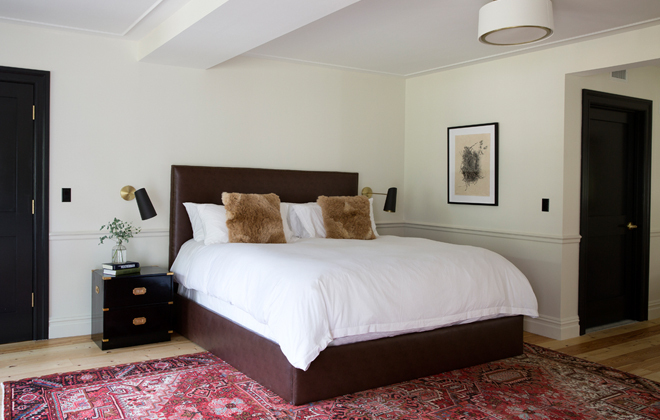 Plus with the luxe Frette Linens, and bathrooms stocked with Kiehl’s products, you won’t want to leave. 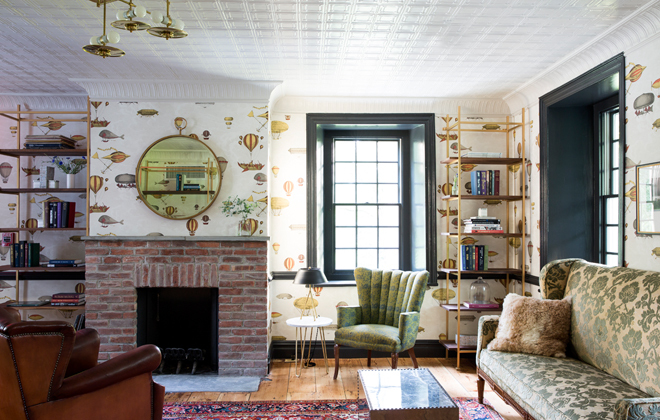 One of the cozy common areas in the house, complete with Fornasetti Wallpaper – a true favorite! There are twenty guest rooms in the main house, cottages on the property to rent out to larger groups, and a beautifully restored classic pool, as well as access to lakes and trails throughout the estate. That means fun-filled activities year round from swimming, to apple picking, to sledding…count me in. I am always a fan of crisp white linens, and dark doors with brass details. Looking good. 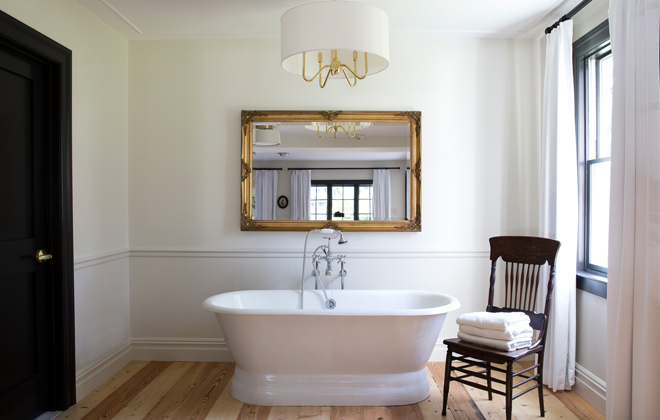 Well, hello there dreamy bathtub! 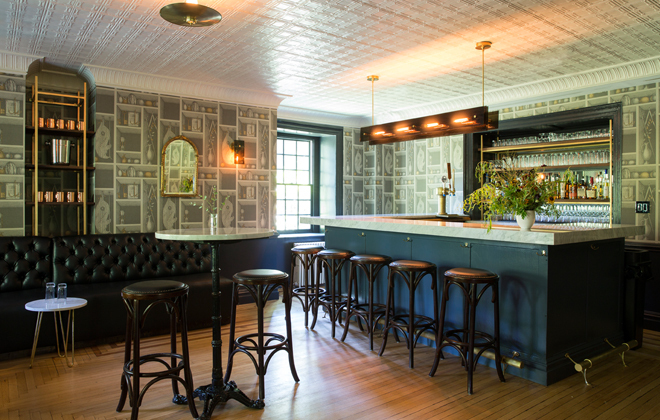 Also not to miss is the Butterfield at Hasbrouck, the wonderful Hudson Valley inspired farm-to-table restaurant at the hotel. Think: apple cider donuts, house cured ham (using the centuries old smoke house on the property), veggies picked right off the farm, and of course, some good old fashioned Hudson Valley Rye to top it all off. I’m ready to make the trip up just for this! How inviting does this bar look? The Hasbrouck House will also host a series of events throughout the season, including Hudson Valley Palate, the Phoenicia Flea (monthly from May-Sept) and the Hudson Valley’s very own Field + Supply, which will have a host of makers and artisans from the community and around the world. All photos courtesy of the Hasbrouck House, shot by Emma Tuccillo.